Virtual mentors help teachers master the classroom. Teachers are getting feedback from mentors online. 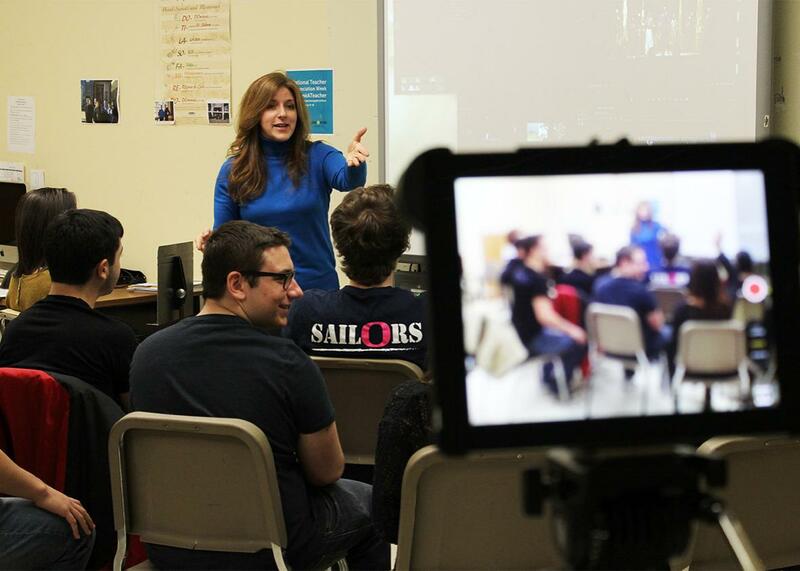 Audrey Miller, a teacher mentor at Oceanside High School on Long Island, videotapes a lesson in her video production class. Nothing in Linda Liptrap’s teacher training prepared her for the pencil onslaught. In 2013, as a novice math teacher at Callaghan Elementary in rural Covington, Virginia, Liptrap was plagued by student requests to sharpen pencils, use the bathroom, and other picayune interruptions. “They were penciling me to death,” Liptrap said. Lessons stalled. Test scores suffered. Callaghan’s principal tried a novel solution to rescue her harried teacher—a virtual coach. A startup called EdConnective matched Liptrap with a veteran teacher in another state trained as an instructional coach. The pair spent six weeks dissecting videos of Liptrap teaching, then plotting classroom strategies in twice-weekly Web chats and reviewing videos of Liptrap practicing those strategies in class. EdConnective is among a handful of startups and education nonprofits offering virtual coaching, both to new teachers struggling to control their classrooms and to experienced teachers hoping to boost critical thinking and engagement. Virtual coaching’s backers promise teachers a sustained high dose of feedback, personalized action plans for their classrooms, and follow-up during implementation—three vital features missing from most professional development, according to a parade of recent reports. As for those pesky pencils, Liptrap followed her coach’s advice and now begins class by announcing that everybody should have two adequately tipped pencils, because there will be no sharpening during the lesson. “It didn’t take but one day of that for the kids to get it,” said Liptrap, whose coach helped her cure several other class-management hiccups. “Teachers don’t get nearly enough good feedback,” said Will Morris, who founded EdConnective in 2013. Multitasking principals can drop by classrooms only occasionally. Many schools, especially in the low-income communities Morris caters to, can’t afford in-house coaches beyond those focused on literacy or math. But virtual coaches can be anywhere. Their services can be purchased à la carte, and they can observe a class any time a teacher uploads video. In most cases, teachers can make videos with iPads or similar devices with a wide-angle view that lets a coach see both teacher and students—noting how many kids raise their hands or stare out the window. “We wanted to extend our reach and give teachers more feedback at a classroom level without always having to send in a large team of people,” said Karla Oakley, senior strategist with the New Teacher Project, a nonprofit that started offering virtual coaching in 2013, augmenting the in-school support services they have provided for nearly two decades. TNTP virtual coaches use BloomBoard, an application that lets them insert time-stamped comments and questions alongside teacher videos. Teachers can view, sort, and respond to these comments, which include thumbnail links to the corresponding video clips. Virtual coaching sessions are “very proactive and very action-oriented,” said Lauren Vargas, a virtual coach with EdConnective. For example, if a teacher wants to give clearer and more concise directions to students, Vargas will play back (or read back) the directions the teacher gave in a previous class. Then, she’ll have the teacher practice a new approach “in their teacher voice” until the teacher gets the hang of it, and she’ll follow up in the next session to see how it went in front of actual students. There’s a stigma that teachers who need coaching aren’t up to snuff, admits Oakley of TNTP, but she counters with an analogy to professional athletes. “They are the best and are paid millions, and they still have a fleet of coaches watching everything they do,” she said. After several years of teaching, Roth joined a staff of teacher coaches at a charter school, positions made possible by a large federal grant. When Roth started at Olney two years ago, he wanted coaches but didn’t have the funds to hire anyone full-time. EdConnective offers coaching sessions of from one to six weeks, ranging in price from $835 to $1,500. Roth makes sure teachers know that coaching is not an evaluation and that the sessions are private, a promise enhanced by using coaches who aren’t on staff. Giving teachers ownership of professional development was the main idea behind a virtual coaching platform developed in 2013 by the folks at Teaching Channel, an online catalog of videos that demonstrate great teaching and lesson planning how-tos. The subscription service, called Teaching Channel Teams, was developed with the Academy for Urban School Leadership, a Chicago nonprofit that pairs newer teachers in Chicago public schools with trained mentor teachers. The centerpiece is a video player that lets viewers insert time-stamped notes and hold online discussions with other teachers. Only team members have access to that content, and even within a team two teachers can keep their exchanges private. About 50,000 teachers have so far used the platform to coach and be coached and to collaborate, according to Erika Nielsen Andrew, Teaching Channel’s chief academic officer. Two years ago, Jennifer Wolfe and Erin Gilrein, teachers at Oceanside High School on New York’s Long Island, used Teams to create a teacher-mentoring program. Both Wolfe and Gilrein have been certified by the National Board for Professional Teaching Standards, a national nonprofit created in 1987 to recognize the highest standards in K–12 teaching. Now, every novice teacher in the Oceanside district is matched with a National Board–certified teacher who coaches the novice using five classroom videos uploaded over the course of the year. “Being a good mentor means spending time in the classroom,” said Gilrein, and the only way to do that in a district the size of Oceanside was through technology. She gives district administrators credit for supporting the program while also agreeing that only teachers could access the videos and feedback on the Teams platform. Whether virtual coaching can improve student achievement is the key question, of course. For now, there’s little hard data to offer an answer. Two independent studies of Teaching Channel Teams, one funded by the National Science Foundation and another by the Spencer Foundation, are underway but won’t be done for three years. Meanwhile, both EdConnective and TNTP’s virtual coaches have increasingly asked teachers to upload scans of student work, along with teaching videos, to keep tabs on how new classroom strategies affect learning.